When you do not feel like spending too much time in the kitchen cooking or washing a mound of dishes after that, but your taste-buds yearn for a vibrant and sumptuous treat, a veg stir-fry is just the thing for you! Stir-fries can be heavy or light. They can be one-dish meals or accompaniments that can be served simply with rice or noodles. Heat a pan and toss in veggies, fruits, paneer, sprouts, etc. Sprinkle some spices, drizzle some sauces ( Soya Sauce, Hoisin Sauce, Worcestershire sauce , Schezuan Sauce) , and sauté till perfectly done, and your yummy stir-fry is ready. Stir-fries are usually done in a jiffy because you are not meant to overcook the ingredients. Cooked at high temperatures with a little oil for a short time, stir-frying boosts the flavour of the food but retains its identity, especially its texture. Stir-fries are easy to cook, super tasty and healthy too! It is very popular in Oriental cuisines, but is delectably employed in Indian cooking too. Indian stir-fries like the Kabuli Chana Stir-Fry, Sprouts Stir-Fry, Turai Stir-Fry and Rajma And Palak Stir-Fry are sure to make the diners ask for another helping! Stir-frying is a method that is popular in Chinese and Thai cuisine, but can be used in practically any cuisine. Just mixing and matching the ingredients and spices will give you a stir-fry with a local touch. You can easily make desi stir-fries with all Indian ingredients! You don’t even need any exotic ingredients. Anything you have at home – veggies, beans, chana, paneer, bring them together with a dash of spices and stir-fry them to make a mouth-watering meal! From purple mogri to French beans, cauliflower, paneer and Kabuli chana, we find that most of our ingredients lend themselves well to stir-frying. Wanna give it a try? Broccoli, water chestnuts, mushrooms, paneer, cauliflower, colourful capsicums, crunchy cabbage, bring them together into your flaming hot wok to make a mind-boggling dish that scores high on the health chart! 1. Keep things ready before you start. Once the wok is hot, you have to swiftly add the ingredients one after the one. You cannot stop. So, prepare all the ingredients and keep them ready on the kitchen counter before you heat the wok. 2. There is no right or wrong when it comes to combining ingredients. You can throw in virtually any edible food into your wok! This makes stir-fries a great way to use up assorted veggies leftover in the refrigerator. 3. Sort the ingredients according to the cooking time. Slow-cooking veggies like carrots and French beans have to be added earlier while fast-cooking ones like bean sprouts and paneer have to be added later. 4. It also helps to chop veggies according to their cooking time and texture. Capsicums can be cubed while cabbage has to be shredded. So, stir-frying is a good way to hone your chopping skills too! 5. Once the main ingredients are ready, prepare an aromatic mixture comprising herbs and spices, which will add flavour and aroma to your stir-fry. Typically, a stir-fry uses ingredients like garlic, ginger, onions, spring onions, dry red chilli flakes and green chillies. You have to chop these really fine for them to be most effective! 6. If you are going to experiment with stir-frying, you need to stock up sauces like soy sauce, hoisin sauce, vegetarian oyster sauce and chilli sauce. Use these judiciously in the proper combinations and amounts to impart a vibrant but balanced flavour to your stir-fry. You can also make innovative sauce mixes using coconut milk, makhani gravy, white gravy etc. 7. Stir-fries are best made in woks. A wok is a utensil that is specially designed for cooking food quickly at high temperatures using minimal oil. It is a large, deep bowl made of thin metal with gently curved sides and a firm handle. The heat concentrates at the bottom of the pan and the curved sides allow you to push the ingredients to cooler areas. If you do not have a wok, go for a kadai. Before you start off, smear a little oil inside the wok or pan with a paper towel. This will help reduce the amount of oil used later in the recipe. 8. Once you have the ingredients, spice mix and sauce ready, it’s time to heat your wok. The wok has to be blazing hot – and that’s very important! Cooking the ingredients over high temperatures helps to preserve their flavour, colour and texture. 9. Use a high-smoking-point oil like peanut, sanflower, corn or canola oil. 10. While stir-frying, you have to keep on stirring the ingredients or tossing them around so that there is equal distribution of heat for fast, uniform cooking. Don't overcook the vegetables – remember they should still be crisp when you are done! Stir-frying takes a bit of practice, to master fine details like how to chop each veggie, which order to add them in, and when to increase or reduce the heat. 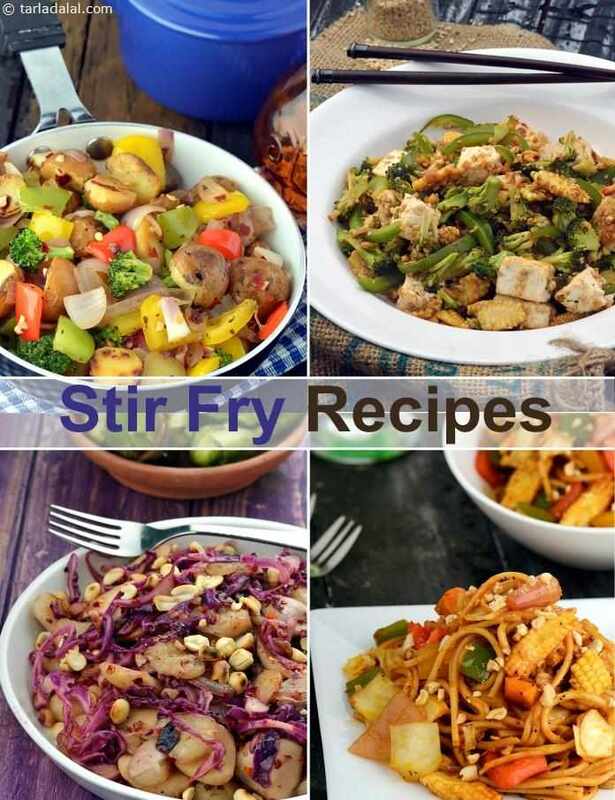 The recipes on our website will help you start off, and gradually master the art of stir-frying. With a little practice, you will know these details just instinctively and will be able to make stir-fries with practically any combo of ingredients. A very pleasing presentation of soft noodles and bean curd combined with fresh vegetables and crunchy peanuts. Savor the delights of french bean and sweet corn in this mildly spiced stir-fry dish. Schezuan peppercorns are known as Tirphal in Marathi and can be found at local baniya shops. It is used extensively in Goan cooking and along the Southern coast. They are also used in Chinese cooking and in this dish, they add more flavour to cabbage which is otherwise a bland vegetable.